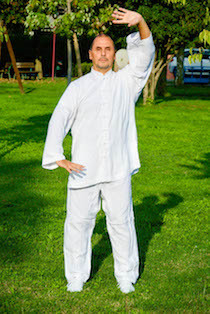 This online series “Six Healing Sounds Qigong (Liuzijue)” contains easy to follow videos of Qigong movements and exercises, accompanied by straightforward instructions. These movements are suitable for all ages and abilities to learn at home (always take your own circumstances and doctor’s advice into consideration!). 噓 XU, sounds like “shu”, making lips round and blowing the sound out, like the wind through the trees in the wood. It’s spring’s energy moving along the body and making it grow. The color to visualize is grass green, the season to feel is springtime, and the direction to face is east. It’s like a deep sigh and harmonizes Liver Qi. 呵 HE, sound like ‘hah’, opening the mouth and letting heat or unbalance go out and away from heart. It has a powerful action on our emotions and nervous system. Color is red, season is summer and direction is south. It’s like yawning or laughing, and supports Heart Qi. 呼 HU, sound like “huh”, and is a light and continuous emission of air, meant to make Spleen and Stomach relaxed and at ease. It’s like expiring with narrow lips. Color is earth yellow, the season is the Indian Summer and there is no specific direction, because Earth is the center, so you can stay where you are. This cultivates Spleen, Stomach and Pancreas Qi. 呬 SI, sound like “shi”, a gently hissing sound meant to clean Lungs and take care of Large Intestine, emptying it. It is close to the idea of a ballon blowing air out and relaxing the whole torso. Color is dirty white, season is autumn and direction is west. This sound supports Lung’s Qi. 吹 CHUI, sounds like “shuee”, and it feels like water running through the body. The idea is that of helping water to keep up Kidney’s Qi, and of spitting out something. Color is blue/black like in a dark night, season is winter and direction is north. 嘻 XI, sounds like “see”, but long and opened, without “ee”, has no sound but a hiss. This sixth element balances all previous organs sounds and energies, balances all body valves and pressures, and has a happy mood. There are no colors, no seasons and no directions to go, again, stay where you are. This allows the Triple Burner to be in harmony and to take care of all other organs. It works on the protection of the Heart, on the Pericardium. Between every circle of six sounds emission, just breath one naturally, only by the nose. In total it will make 6 x 6 times. When closing, just move your arms in circle again six times, breathing normally and closing hands down and relaxing. Do not move suddenly for a minute after completing exercises. A regular session should last between 20 and 30 minutes. If needed, the whole circle can be repeated. In time you will learn which elements you need to reinforce, so you can go back to it and repeat only this sound. My suggestion is to repeat it always among the other sounds.